• 1) Standard Starting dose is 1 gram/gallon: best in fluidized reactor. EXAMPLE: 8 grams= 1 level tablespoon, 16Tbsp=1 cup. 1 cup per 128 gallons to start, 1 cup per 64 gallons standard dose. • 2) Monitor phosphates, add or change media when levels start to rise, or if algae increases. Sometimes the algae consume so much phosphates the levels test low while algae growth is still present. Once break in period is over, continue increasing until algae is controlled, or switch to High Capacity for stubborn algae problems. For optimal effectiveness, do not allow overall Phosphate levels to test above 0.05ppm. Test water coming directly from the phosphate reactor for phosphates. 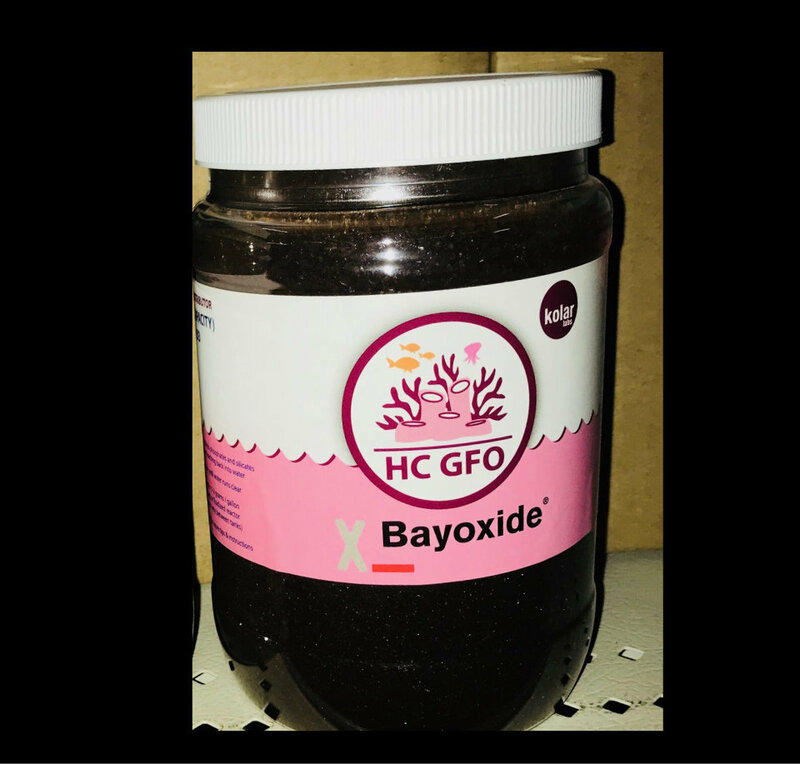 If any phosphates are present, GFO should be increased or replaced. • 3) For best results, Pre-filter water going into reactor, and water going out (example: filter sock on effluent to trap fines, especially with new media). Pro tip: Remove all sponges before and after media in reactors and replace with plastic mesh to prevent clogging. Add small check valve to pump side of water line/keep return line submerged, to prevent back siphoning into pump in a power cut. • 4) Rinse all new media and discard discolored water from rinsing before use. Pro tip: Use bucket full of tank water and submerge pump and reactor in it. Run pump with return line running to drain until discoloration stops, then return line back into bucket. Run for a few minutes checking for proper fluidization. Check for Air bubbles or pockets, and gently tap or tilt reactor to eliminate them. Return pump and reactor to sump or tank together. • 5) Check weekly for good flow and fluidization. If clogged, dump reactor contents into 5 gallon bucket with tank water, stir and poor off debris. Media can then be returned to reactor in part or whole. Pro tip: Use this technique when changing media, and save approx. 1/4 of old media to mix into new media, keeping bacterial cultures stable to prevent bacteria or algae bloom from media change. If used in canister filter, use micron bag to hold GFO preferably in thin layers to keep good flow, and reduce channeling through media. • 6) If any negative coral reaction is noticed after new or changed media, reduce amount by half. Dropping phosphates too quickly can cause shock, once established, overdose is unlikely and phosphates will not leach back into system.